Rye Sustainability has put together and is implementing a six-month Food Scrap Recycling pilot program, due to begin March 4, 2019. The pilot will be open to all Rye City residents. For more details of the RSC pilot, the benefits of food scrap recycling, and additional resources, please click on Quick Links or the icons, below. A special note of gratitude to Ron Schulhof and Michelle Sterling, Scarsdale Conservation Advisory Council, for their invaluable assistance and guidance. Drop-off: Open to all residents. Rye FSR Drop-off Site at Disbrow will open March 4, 2019. Residents must register to access the FSR Drop-off Site. Please sign up by completing the online registration form (click on yellow banana). Curbside: Limited to 150 households. Service will be weekly on Wednesdays and begins Wednesday, March 6, 2019. Participating households must register and pay a one-time subscription fee of $26/household to be included in the DPW's Food Scrap pickup route. Please register by completing the online registration form (click on yellow banana). 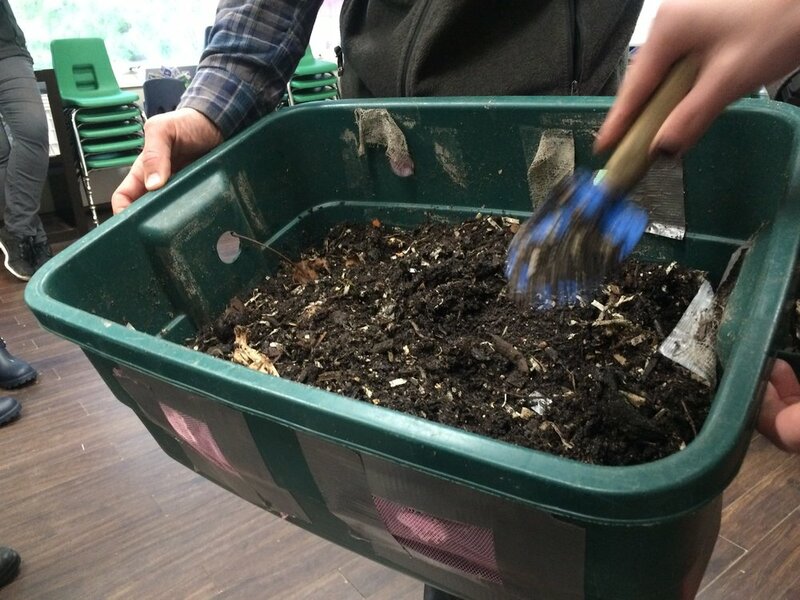 A City-approved FSR Starter Kit (countertop pail, medium-sized locking storage bin, 25 bin liners) must be used for participation in the program. Total cost for one starter kit is $20. Additional compostable bin liners and supplies are also available for purchase from DPW. Kits and supplies can be purchased by check. Please make checks payable to City of Rye and pay at Disbrow Recycling Center, 141 Oakland Beach Ave. The Disbrow Recycling Center food scrap drop-off site at 141 Oakland Beach Avenue will be open for resident food scrap drop-offs Monday through Friday, 6:30 AM until 3:30 PM, and can be used whether one participates in the curbside pickup program or not. Please register first with DPW and purchase your starter kit! Curbside pickup will be once weekly on Wednesdays. Food Scrap bins must be placed curbside by 6:00 AM on pickup day. For questions about the Rye FSR program, contact DPW/Rye Sustainability at foodscrap@ryeny.gov. A brief Food Scrap Recycling Guide is available online. A Curbside Supplement is also available. In short, COLLECT, TRANSFER, BRING, and, if registered for the curbside program, PLACE CURBSIDE. Food Scrap Recycling is easy! COLLECT your food scraps in a countertop pail; all food is accepted, but should not be mixed with non-food or non-compostables, as described in the Non-Accepted Items section below. Although not required, you may line your pail with a certified compostable bag – plastic bags are not permitted. The mandatory FSR Starter Kit ($20/each) includes everything you need and can be purchased at Disbrow Recycling Center, 141 Oakland Beach Avenue. Make checks payable to City of Rye. TRANSFER food scraps collected in your counter pail to the City-approved bin for weekly storage, generally about three to four times per week, depending on your level of usage. These storage bins can also be used to transport food scraps to the Disbrow Recycling Center. It is recommended that food scrap storage bins be kept in the house or in the garage – not outside. BRING your storage bin to the Food Scrap Recycling drop-off bins at the Disbrow Recycling Center, Monday through Friday, 6:30 AM - 3:30 PM, to dispose of your food scraps as often as needed. CURBSIDE ONLY: PLACE CURBSIDE no later than 6:00 AM on Wednesdays, and/or drop off at the Disbrow Recycling Center, Monday through Friday, 6:30 AM - 3:30 PM. Wondering where your food scraps go? Ulster’s guide is a handy visual of what is and isn’t accepted. Click to enlarge image. Newspaper (although newspaper can also be recycled). Newspaper soiled with grease/food cannot be recycled so adding it to your FSR bin is a great option. A compostable product must be certified as such by a reputable certification agency. See the Ulster County graphic, above, for proper labeling and read more here about how to tell the difference between acceptable and not acceptable compostable products. Still have questions? No problem! Contact us with your questions at foodscrap@ryeny.gov. Community Composting Comes to Rye!